As a cultural asset, computer games are up there with books and have found their way into libraries. Increasingly, libraries are presenting themselves as play places. Does the future lie in the “gamification” of library use? Libraries as play places? | © digital cat via flickr.com, Lizenz CC BY 2.0 Playing and learning have been seen as opposites since time immemorial. Yet in only very few cases does this contrast correspond to the reality of life. An entire generation is now growing up with computer games and demonstrating how fun in play, learning and work merge: in virtual worlds even the hardest nut can be easily cracked in play. Because computer games have everything that a successful learning experience needs: they set clear goals, provide immediate feedback, take away the fear of failure, open space for creative thinking and social interaction. Game worlds reduce complexity, foster the feeling out and exploration of the new and enable us to engage in trial actions. Computer games are now firmly in the mainstream of society: they find users across all differences of age and education. Especially young people expect to find the operating principles of games even outside the game world. Accordingly, today game principles that we otherwise know only from computer games are ever more frequently found in non-gaming contexts. The name of this trend is “gamification”, the deliberate use of gaming mechanism to raise people’s motivation and to encourage them to adopt a certain kind of behaviour. The trend, born in the United States, has already found its way into the world of libraries. Thus, for example, with Summer Game the city library in Ann Arbor, Michigan, offers its users not only gaming fun but also takes an innovative path for presenting library services, learning information skills and encouraging visitors to use the library. In the best computer game manner, the library user receives points and badges for engaging in various actions: for instance, for successfully finding a book in the library catalogue or writing a blog entry. The earned points can then even be redeemed for prizes. 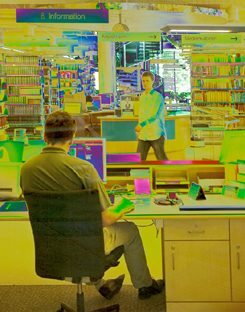 Librarygame, a software programme that can be integrated into a library’s own system and so can transform the use of any library into a game, offers something similar: borrowing or returning a book, recommending or evaluating a book and similar actions are rewarded and the success made visible. More rapid advancement in the game can be achieved by those users who can perform a combination of actions – for example, going to the library three times on the weekend, reading all the works of an author or borrowing books on the most various topics. There then ensues a contest in library use. Because games are the defining medium of the digital age, and because they were recognized in 2008 as a cultural asset of equal status to classical media such as books, they will play an increasingly more important role in cultural education and the transmission of knowledge. “Libraries will have to be seen and present themselves as sites of gaming culture”, explains Christoph Deeg, consultant for social media and gaming and author of the book Gaming und Bibliotheken (i.e., Gaming and Libraries). But this will require, according Deeg, nothing less than a profound cultural change. The move to include games among media assets has already been made. The first libraries are already experimenting with presenting themselves as play places and offering gamers a platform for collaborative gaming. Thus the programme of the Cologne City Library regularly includes events for gamers. With games4kalk, the Cologne branch library in the district of Kalk has launched a model project in playful learning with computer games. 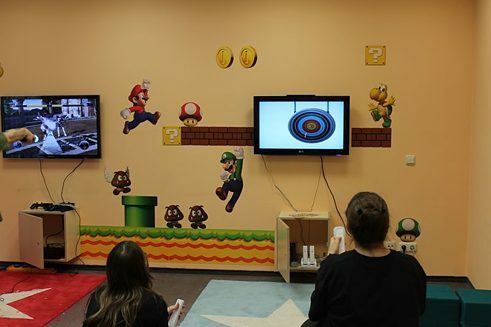 A specially designed gaming zone was set up in the library, where every week a games tester group meets and events for intergenerational games and regular tournaments take place. The City Library of Neukirchen-Vluyn invites children and young people to their daddelBIB to test computer games and play together there under supervision. The media educational project Dr. Ghosthacker – Night in the Library even sends children and young people on a search for scoundrels in the library so as to acquaint them playfully with the available media and at the same time promote media literacy. “A growing number of libraries has recognized that computer games are a mass and guiding medium and that their immense attraction can lure above all young people into libraries, but also that the medium is suited to serve the transmission of knowledge”, explains Cordula Nötzelmann, Head of the Decentralised Library System at the Cologne City Library. The learning and gaming principles of computer games have not yet been integrated into the working tools of German libraries. Following the example of Summer Game and “gamifying” the library catalogue or promoting playful interaction with contents could of course call forth new forms of education: if the search for and exploration of information takes place playfully, learning occurs almost automatically and by the way. Nora S. Stampfl is a writer, futurologist and organizational consultant tracking social change. In 2012 she published “Die verspielte Gesellschaft. Gamification oder Leben im Zeitalter des Computerspiels” (i.e., The Playful Society. Gamification or Life in the Age of Computer Games).